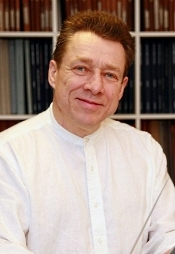 Roy Goodman, Manitoba Chamber Orchestra. CBC Records SMCD 5227. 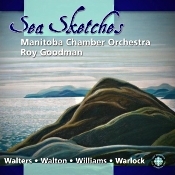 This album of English string music seems well titled, as it is the Sea Sketches by Grace Williams that contain among the most memorable tunes on the disc. Ms. Williams (1906-1977), probably best known as the first female Welsh composer of distinction, created in the Sea Sketches a series of five descriptive movements that may remind some listeners of Claude Debussy's La Mer or Frank Bridge's The Sea, if not in actual substance at least in mood. The Sea Sketches comprise individual tone poems labeled "High Wind," "Sailing Song," "Channel Sirens," "Breakers," and "Calm Sea in Summer," each of them highly evocative. My favorite is "Channel Sirens," in which one can hear the sounds of the sea nymphs singing in the instruments. It's all quite charming under the guidance of Roy Goodman and the Manitoba Chamber Orchestra, an ensemble small enough and light enough to give the music the intimacy and transparency it needs. Not that the other works on the disc are in any way negligible, but like any collection of similar material, in this case short string pieces in the English pastoral mode, things can begin sounding alike after a short while. Anyway, the other compositions include the Divertimento for Strings by Gareth Walters; the Serenade for Strings by Peter Warlock; and Two Pieces for Strings from the film Henry V and the Sonata for Strings, both by Sir William Walton. It's all quite lovely, personally chosen for inclusion in this collection by their conductor, Roy Goodman, probably better recognized for his period-instruments recording with the Hanover Band but here, as I say, doing a fine job with the Manitoba players. I wish I could wax as enthusiastically about the Canadian Broadcasting Corporation's sound as I can about the performances. Unfortunately, the recording, originally released in 2000, seems to me fairly ordinary by today's best standards. The audio is in no way poor, mind you, but it doesn't exactly jump out at one as sounding particularly live; unless you play it softly and pretend you're sitting in an auditorium at a moderate distance from the players. In any case, the sound displays a good left-to-right stereo spread, a decent illusion of depth, but an overall soft and slightly veiled presence. Perhaps it suits the relaxed nature of the music.